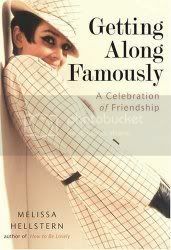 To be perfectly honest, the only reason that I picked up this book is because it had Audrey Hepburn on the cover. I think she is fabulous, and I decided that maybe since the book featured Audrey Hepburn on the cover, it couldn't be all that bad, right? Well, luckily I was right. Getting Along Famously is a collection of vignettes about famous friendships. Audrey Hepburn & Sofia Lauren; Julie Andrews & Carol Burnett; Lucille Ball & Vivian Vance to name a few. Each vignette gives a little history on the friendship and each person and includes photos and additional quotes and anecdotes from their lives. A fun little volume, not hard to read at all, but informative all the same.